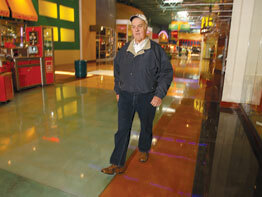 The food court at Arundel Mills Mall is the biggest distraction for mall walker Ed Goodwin Sr. Although self-proclaimed as a bit overweight, the 6-foot-2, 67-year-old said he has no health issues, good blood pressure without ever having smoked or drank alcohol, takes no medication, and received a good bill of health Sept. 23 from his doctor, who certainly encourages walking. Mr. Goodwin typically goes to the mall after his early morning work day (which starts at 4 a.m.) at E. Goodwin & Sons Inc., his seafood distributing business in Jessup. “I eat a lot of fish,” said the 1959 graduate of Loyola Blakefield, Towson. Four or five days a week, 30 minutes a day, he jaunts once around the enormous oval mall in an effort to keep down his weight. The senior doesn’t tire of Arundel Mills Mall for its spaciousness, width and ease of passing shoppers as he moves steadily along, even when it’s crowded. Bass Pro Shops Outdoor World is the store which lures in Mr. Goodwin, admittedly, as he often hunts and fishes. Except for mall walking indoors, he loves the outdoors. In Baltimore County, Tina Jackman enjoys mall walking for its safety in numbers and its controlled temperature. She used to have walking partners but now walks unaccompanied, and enjoys seeing and talking to the regulars. Mrs. Jackman, in her late 60s, walks about 45 minutes for 2.5 miles Monday through Friday at 7:30 a.m. – five times around the upper level of White Marsh Mall, which opens at 6:45 a.m.
After hearing general hints from her doctor to “get some exercise,” Mrs. Jackman has been walking for almost two years. “Walking fits right in,” she said, not so much as a means of losing weight, although she has dropped 10 pounds, but for stamina and endurance. At 5-foot-4, the full-time Coldwell Banker realtor said she wouldn’t mind dropping another 10. With Nikes to propel her along and sporting a T-shirt and shorts in warmer months, Mrs. Jackman briskly walks to the music piped in the building or sometimes to the music on an iPod. She notices all sizes and ages of people walking – some there temporarily for hip replacement therapy, but most for the exercise and social aspect. According to Mrs. Jackman, the majority are between the ages of 55 and 70.